Trade in Services "An answer book for small and medium-sized exporters"
What is meant by ‘trade in services’? Cross-Border The supply of a service from the territory of one member into the territory of any other member. Consumption Abroad The supply of the service in the territory of one member to the service consumer of any other member. Commercial Presence The supply of a service by a service supplier of one member, through commercial presence in the territory of any other member. Temporary Movement The supply of a service by a service supplier of one member, through presence of natural persons of a member in the territory of any other member. What is the contribution of trade in services globally? Trade in services is a fast growing component of world trade approaching 25% and representing approximately 60% of world foreign direct investment stock. In 2003, the dollar value of global commercial services exports expanded by 13%. Today, services constitute at least 50% of employment in most economies and represent a growing component of manufacturing and agricultural production. Services also play a central role in economic development. 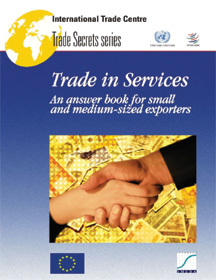 Why ‘Trade in Services: an answer book for small and medium-sized exporters’? In Pakistan, Services represent at least 53% of GDP as well as its contribution in employment generation is growing steadfastly. It has strong forward and backward linkages with the major sectors of the economy such as textiles and commodities. Pakistan’s total exports in services was US $ 3.77 Billion and imports US $ 8.20 billion during 2006. The sub-sectors which contribute greatly to the services sector overall include financial, construction and business services such as computer, IT, engineering, legal and accounting services. Information technology and related services are the most significant in terms of scope and scale of export markets and to the extent which these services are currently being delivered. Professional services, such as legal and accounting, are the promising sector. The adapted version of the ITC publication Trade in Services: An answer book for Small and Medium-sized exporters, provides a useful resource for Pakistan services exporters and SMEs. Using a question and answer format it provides practical advice to help them improve their export performance or enter new markets. Who must review ‘Trade in Services: An answer book for small and medium-sized exporters’? Students and instructors needing a comprehensive overview of services sector of Pakistan and services exporting.